Robert "Bob" Dittmar, 93, of David City, died Thursday, February 22, 2018 at david place in David City. Visitation Tuesday 4:00 p.m. to 7:00 p.m.
Robert Joseph “Bob” Dittmar was born January 11, 1925 to Hugo and Anna (Gocken) Dittmar at Rising City. He was baptized and confirmed at Immanuel Lutheran Church, rural Rising City, where he was a lifetime member and served on the church council for many years. 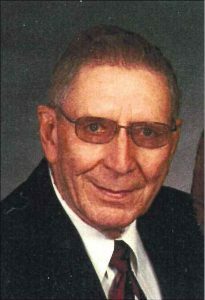 He received his elementary education at Immanuel Lutheran School and attended high school at Garrison High and graduated from Rising City High School in 1942. Robert married Arlene Rathje on June 3, 1951 at St. John’s Lutheran Church, rural Rising City. They were blessed with three children. They lived and farmed in the Surprise and Rising City areas. Robert enjoyed working with wood and worked part time at the Shelby Planning Mill, Rising City Community Builders Lumber co., Ulysses Lumber co., Ocken Carpentry of Staplehurst, and Behlen Manufacturing of Columbus. He was a Husker fan and enjoyed traveling. Robert and Arlene moved to David City in 2003. Robert is survived by daughters Rhonda White of Lincoln, Rena Rech (Joe Truksa) of David City. Son Rod Dittmar of Greenwood Villiage, Colorado. Grandchildren Branden (Cassie) Rech of Ashland, Amber (Curt) Hobscheidt of Olathe, Kansas, Kaleb (Crescencia) White of Lincoln, Leah Bucco-White (Peter Morris), of Lincoln. Great grandchildren Halle, Kenna and Lennyn Rech, Hendryx Hobscheidt, Gianna and Oliver Morris. Sister Doris (Robert) Pollock, Lincoln. Brother-in-law: Norbert (Joyce) Rathje, Rising City. Sister-in-law Paula Rathje of Lincoln and many nieces and nephews. He was preceded in death by his parents, wife of 65 years Arlene in 2016, son-in-law John White, sisters and brothers-in-law Dorothea (John) Pollock, Luella (Dale) Busse and Norman Rathje.